← Inflation: A Schizophrenic Target! A truce between Greece’s creditors averts an immediate panic over Greek bankruptcy this summer, yet as officials and onlookers digested the deal, it became apparent that less was agreed than meets the eye. The deal, struck in the small hours of Wednesday morning at the Eurogroup meeting of eurozone finance ministers in Brussels, broke an impasse between Germany and the International Monetary Fund that was holding up Greece’s bailout funding for this summer. The main breakthrough, heralded by German Finance Minister Wolfgang Schäuble, is that the IMF agreed in principle to rejoin the Greek bailout effort this year with new loans. In return, Germany and other eurozone countries pledged to restructure Greece’s rescue loans in 2018 “if…needed.” That promise fell short of the IMF’s demand that Europe should decide now how it would relieve Greece’s debt in coming years. Mr. Schäuble on Wednesday dismissed Mr. Thomsen’s caveats, insisting that new IMF loans were now assured. “He probably was tired then,” Mr. Schäuble told reporters. Mr. Thomsen on Wednesday hailed the IMF’s main gain: a promise by German-led eurozone creditors to undertake a far-reaching restructuring of Greek debt in 2018. “We welcome that it is now recognized by all stakeholders that Greek debt is unsustainable, and…that Greece will need debt relief to make that debt sustainable,” he said. However, Germany previously promised the IMF and Greece in 2012 that it would offer debt relief later if needed—only to reject such a move afterward, citing Greece’s failure to implement all of its promised economic overhauls. The latest debt promise hinges once again on Greece’s ability to complete its side of a tough bailout plan that has proved beyond the political stamina of all Athens governments so far. Germany´s trick is to make contingent promises, when it knows the conditions will be impossible to meet! 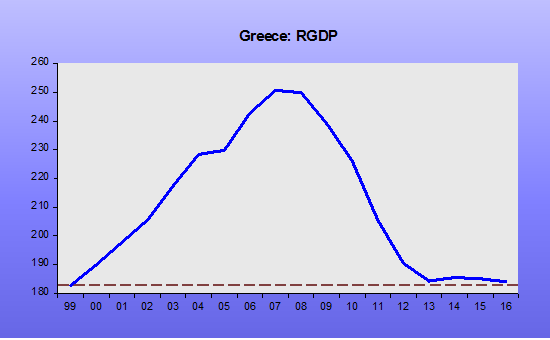 Meanwhile, Greece´s RGDP has acquired a Bell-shaped appearance, capped below at the 1999 level! The nature of these meetings is that the hallway chatter is always more interesting that the formal program. Part of the reason why is that, particularly when talking to journalists, the businesspeople or politicians tend to regard those conversations as off the record. So I’ll abide by that here. One of the German execs was a consultant, and the other headed what I’ll call a quasi-official German organization. I almost choked on my croissant. Yes, I replied, I am aware of that. I lived and worked in Berlin as a journalist in the mid 1990s, when that very painful (economically speaking) process was taking place in Germany. But doesn’t that, I said politely, rather beg the question: Germany integrating their brethren, who’d been isolated and impoverished during the cold war, was a dream come true, whatever the cost. Germans, on the other hand paying to bail out Greece is, to average German, rather the opposite of a dream come true, is it not? Here was my ‘choking on my croissant’ moment number two. Most economists would agree with what my friend at the meeting had said; but he seemed either oblivious (not likely) or simply unconcerned (more likely) with the flip side of what he had just uttered. Italy, to take the third-largest economy in Europe, one with a sizeable and modern industrial base, is stuck with a currency — the euro — which is stronger than the old lira would be under current circumstances. But membership in the euro zone means Italy can’t devalue to bring some relief to its exporters. I pushed back politely. Look, I said, it’s not Greece I’m worried about. It’s Italy. Third-biggest bond market in the world. Bond spreads this morning again heading over 7%(before the ECB intervened this to push them back down again.) Too big to fail, too big to save. Is the government, even one under a new Prime Minister, going to push through sufficient austerity to avoid a default? And make no mistake – that, in essence, is where the European crisis stands. It seems it still does! This entry was tagged Germany, IMF. Bookmark the permalink.